In building this website, it has been my primary consideration to compile as much information and as many images as possible in the limited amount of time available. I’m no expert, just an enthusiast who enjoys learning about the subject. Though I’ve researched and written about associated vehicle histories in my other vintage museum websites, I decided here not to amend various historic articles I’ve used, but to reproduce them and quote their source so you can visit the various websites from which they come. I suppose I’ve used a process similar to my vintage restorations, ie collect lots of parts to go with the main body and, when there’s enough, start to hang it all together. Again, like a vintage vehicle, once it’s up and running, I’ll no doubt ‘add accessories’ and refine it later. I’ve also copied relevant pages from various veteran books I’ve come across on the subject. 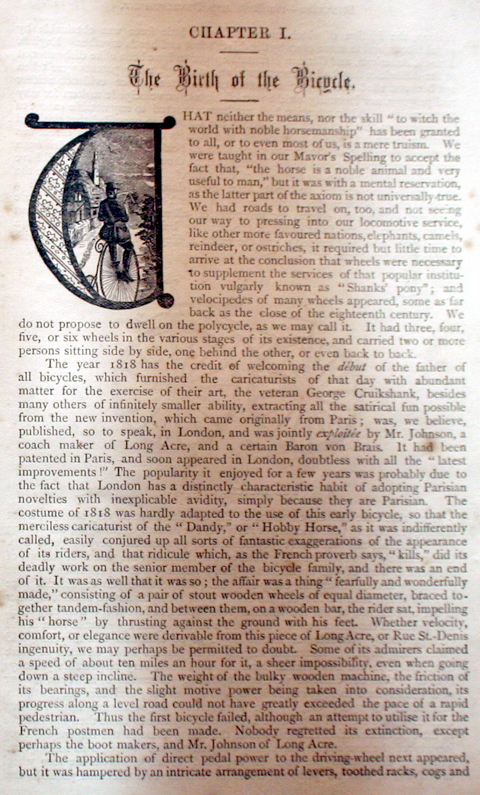 The 1876 book, below, is interesting in that it shows bicycle history before the time when the Rover Safety and Dunlop tyres had revolutionized the bicycle and made it freely accessible to the average person. It may be interesting to see the early development of bicycles against the background of other vehicles of the time. Note that by the turn of the 20th century, the bicycle had been around for a while and its design was already pretty much the same as it is now, a century later. It was very refined compared to the cars and motorcycles that were still very much in their infancy. Here are extracts from another Cordingley book of the Victorian era, illustrating some of the vehicles on offer in the ‘Motor-Car and Motor-Cycle Exhibition’ at the Royal Agricultural Hall, Islington, from 3rd to 15th July 1899. The turn of the 20th century could have been the heyday of electric vehicles. Though the severe speed limits imposed on motorized transport was lifted, petrol-driven vehicles were still in their infancy. Though limited then, as now, by the distance you could travel on your charged battery, electric vehicles had one advantage: they had their charge from the outset. Petrol vehicles had to carry their supplies with them. There were no garages as we know them today! One of the things I love about India is how it reflects our own ancient transport history. The photo below, taken while travelling round rural Gujurat in 1997, is what I describe as an Ahmedabad ‘garage.’ The petrol is dispensed in plastic containers, filled from the petrol bowser in the background.